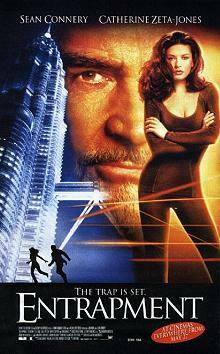 Insurance investigator Virginia Baker (Catherine Zeta-Jones) is on the trail of the elusive famous elder-statesman of cat burglars, Mac (Sean Connery). She persuades her boss (Will Patton) to let her set a trap for Mac. Entrapment, set on the eve of the year 2000 when the Millennium Bug controversy was at its height, is a classic caper film. Virginia is a lithe and beautiful woman who is used to being able to seduce or manipulate others with her charm and/or looks. She sets her cap at Mac, easily the oldest cat burglar the genre has ever seen, and the two engage in larceny and a battle of wills and egos. Despite the age difference between the actors, and the credibility gap in such an well-aged master thief, Entrapment is a well-paced and engaging film. Beautifully shot, fascinating in its technology, and with just enough twists to keep the audience interested. Very watchable.